You have been asking us for a tool to find and merge duplicate records within our commercial real estate software, and this week we released it. You can now find duplicate contacts, companies and properties using criteria you specify, and then merge those records together. 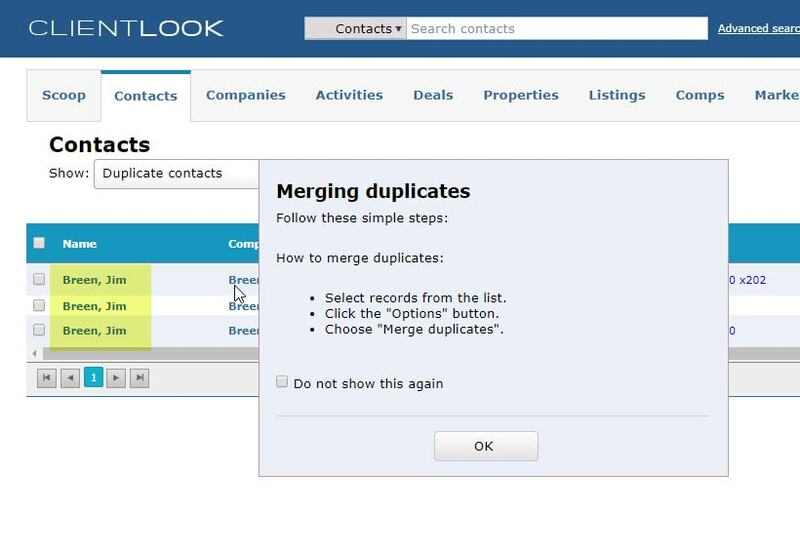 I’ll illustrate how to merge duplicate records in the contact module of ClientLook, but it works the same in all modules. From the main list view of contacts, select the “Options” menu and click on “Scan for duplicates”. The first thing you need to do is choose the criteria for determining duplicates. Each module has a different set of logical fields. Here in contacts, I might choose to match on email address only, or perhaps First Name, Last name and Company. It’s up to you and you can choose up to four fields. For this demonstration, I’m going to select First and Last name and then click the “Scan for duplicates” button. You will be presented with a list of duplicate records that match your search criteria. In this case, there are only three, and they are all the same person. There is also a set of instructions informing you about how to do the merge. It’s simple – simply check off the records that you want to merge, and leave unchecked any which you don’t want to merge. If you have several sets of duplicates, you want to do one person at a time. Performing the merge is really simple – simply put a check mark next to the records that you want to merge, and leave unchecked any which you don’t want to merge. Once you have chosen the records and are ready to proceed, simply click the “Merge selected records” button to start the process. It’s important to note that the field data will not be merged in from the other records, so you want to make sure that your winning record contains the phone number, email address, etc. that you wish to keep. Then simply click the “Merge duplicates” button. If you had additional sets of duplicates to combine, they will appear on the screen and you can repeat the process until they are all done. Once there are no more left, you will see “No records found”. If I click back on my “Recent contacts”, you can see that only the chosen record remains and the others are no longer visible. Never fear though – the duplicates haven’t been deleted, only hidden. If you ever want to see those merged records, from the “Show” menu choose “Merged duplicates”. From this list of merged records, you can pull up any record which you had hidden. When you are ready to permanently delete them, just use the “Delete” option on the “Options” menu. That’s it! Merging records was designed to be simple to use, like all of our design choices at ClientLook. If you’re not a ClientLook CRM subscriber, contact us today to schedule a demo. looks great will be giving a try soon. Thanks.